VILLA FULL VIEW BORDEAUX RANCE, with large garden and direct access to the Rance. House with 4 bedrooms and 2 bathrooms with a superb view of the Rance. At the heart of a garden of more than 1 hectare, this large family home offers a unique view of the Rance. True haven of peace, with its large terrace surrounding the house, you can organize barbecue and dinner with family and friends. - A kitchen with direct access to the terrace, open to the living room. It is equipped with: refrigerator, hob, oven, microwave, dishwasher, dining table minimum 8 people and storage. - A living room with fireplace and large windows with a view of Rance. - 4 bedrooms on 2 levels. * upstairs: 1 bedroom with double bed, 1 bedroom with 2 twin beds (90x190). - 2 bathrooms with shower and toilet, one on each level + washer dryer. - 1 separate toilet level kitchen. - 1 garden: ground: 1,5 hectare, sported and closed by hedges without any opposite, portal and minimum 3 places of parking. - 1 terrace around the house with fixed barbecue and garden furniture. - Free Wifi, box in the villa. - Possibility of mooring a boat at the foot of the house, on mooring. Annex provided if needed. 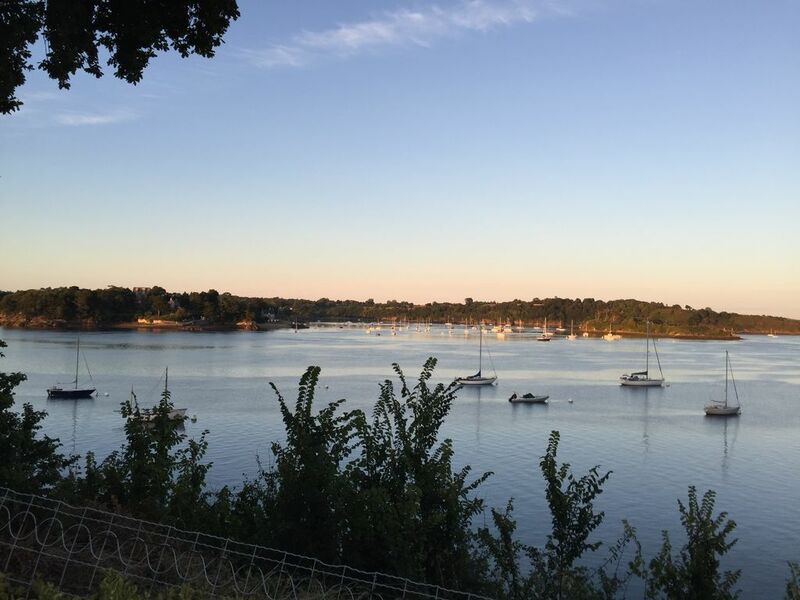 - Proximity Saint-Malo (12 km), Dinard (7.5 km), Dinan (19 km). - Shops nearby 9 minutes by bike (not supplied), and bar-restaurant (Jersey Lillie) on the hold of Jouvente. - All equipment is provided for your stay. The price includes linen, beds made and toilet line, water, electricity and heating. Villa with full river view, direct access to the river Rance, and expansive garden and lawn. Perched on a landscaped garden of more than one hectare, this large home offers a unique view of the Rance river. A veritable oasis, with outdoor areas for dining and relaxing, you can easily get together with friends. - A large kitchen with direct access to the terrace and open to the living room. It is equipped with a fridge, stove top, oven toaster, microwave, dishwasher, and a dining table for 8. The kitchen contains all the essentials for cooking and eating. - A large living room with a fireplace and large floor to ceiling windows / glass doors, with an exquisite view of the river. One bedroom with a double bed, one bedroom with two twin beds on the second floor. Bathroom with shower. - A water closet (toilet) located at the entrance of the house, near the kitchen. - The garden and lawns cover 1.5 acres, with flowers, trees, and parking for at least three cars. The terrace has a barbecue and outdoor dining table and chairs. The house and grounds are enclosed and very private. - Option to moor a boat with a small house, small boat provided. - All necessities provided for your vacation. The fee includes sheets, towels, water, electricity, and heating. A WC is also available near the kitchen. Tolle Lage! Die Einrichtung: typisch französisches Feriendomizil. Wer Ruhe abseits von Rummel sucht ist in dieser Unterkunft bestens aufgehoben. Un Havre de paix dans un cadre de rêve ! Nous avons passé un merveilleux séjour. Mes enfants ont adoré cet endroit... son parc. On se sent tout de suite bien dans la maison, un peu comme chez soi. Elle séduit par son charme et par sa douce simplicité de vie. La vue est magnifique de la terrasse, du salon..., le calme ressourçant. Déjà nous aimerions y séjourner à nouveau. Nous reviendrons ! Superbement située ds un cadre dominant la Rance et offrant une vue époustouflante à tout moment. Jolie maison de vacances de famille aux charmes propres à ce genre d habitation. Grand volume de l espace cuisine et séjour structuré autour de la vue et des lumières changeantes de la journée. Belle espace de jardin joliment entretenu, suffisamment clôturé pour laisser un chien pas trop fugueur ou entreprenant se laisser aller à ses vagabondages. Nombreuses terrasses desquelles jouir de la vue (une fois encore) Proche (en voiture) des poissonneries, boucheries et supermarchés bien achalandés. Très bonne situation pour visiter cette partie de la Bretagne. Nous avons adoré et reviendrons volontiers. Les loueurs sont charmants et de contact aisé.